After a topic like freedom fries, it feels necessary to defend the French. When it comes to the size of their military they come in behind Greece, but ahead of Spain, Germany and most of their other European neighbors. Nonetheless they retain, at least in the West, a poor military reputation. Despite the nature of their loss in WWII, a portion of their population remained engaged in resistance through out the war, and that includes propaganda efforts. As you may have guessed, in the 1940s that would include radio. France declared war against Germany in September of 1939 in response to their invasion of Poland. But there was little fighting between 1939 and 1940. Winston Churchill called this 8-month period the "Twilight War." The Germans agreed, calling it the sitzkrieg or "the sitting war." In France it is referred to as the drôle de guerre the "strange" war. U.S. Senator William Borah [R] called it the "Phoney War" [note the British spelling] and many historians continue to use that term today. In May 1940 Germany invaded Belgium, the Netherlands and Luxembourg definitively ending this 8-month interregnum. So let's back up twenty years and we can get back to our strange, phoney, twilight sitters. Radiola was a privately owned French radio station founded by engineer Emile Girardeau. It broadcast under that name from November 6th, 1922 until March 28th, 1924 with the intention of promoting the sale of domestically produced Radiola brand radios. 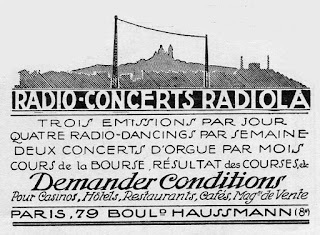 This Paris-based station made its first test transmissions on June 26th, 1922. 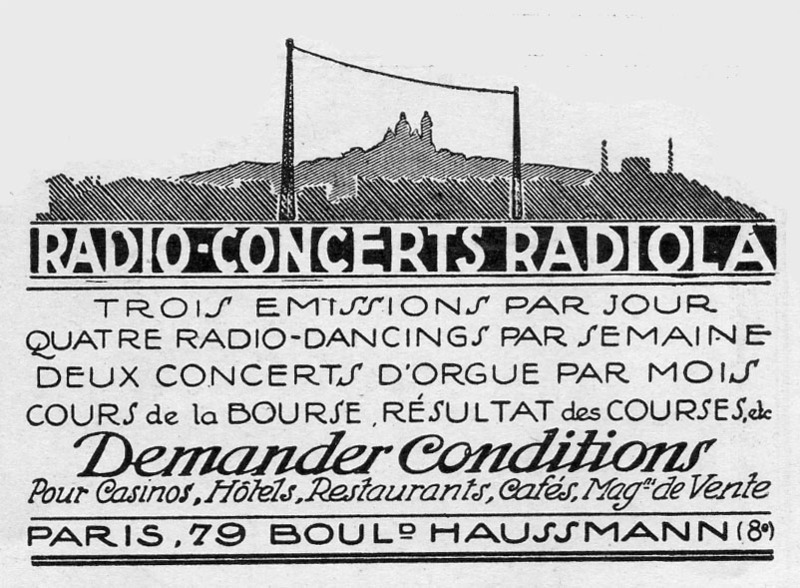 Ownership was eventually transferred to the French Government, and it was renamed Radio Paris on March 29th, 1924. More here. Back to 1939. In the so-called Twilight War, not all of the French were aligned with the Allies. In may of 1940 German invaded France and the country was divided into German-occupied France and a free zone in Southern France. But the new government under Philippe Petain in Southern France was very authoritarian and committed to appeasement with Germany. So it's not surprising there were collaborationists even in Vichy France. Jacques Doriot was a staunch pro-German and supported Germany's occupation of northern France in 1940. Radio Paris became a propaganda outlet. In the unoccupied zone Radiodiffusion Nationale became another propaganda outlet, Radio-Nationale de Vichy. Doriot was so pro-fascist he actually moved from Vichy France to German occupied France to espouse pro-German and anti-Communist and anfi-British propaganda on Radio Paris. More here. State-run broadcasting suffered in the first months after the Strange War. But the transmitter of the Eiffel Tower was sabotaged on 6 June 1940 so that the Germans could not use it and on the 10th, the public radio station was relocated to Bordeaux where the programs resumed. 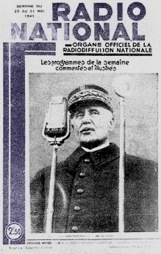 On October 30th, 1940, Petain made state collaboration official, declaring on Radio Paris: "I enter today on the path of collaboration."